Has Pan and Tilt locks, a continuously adjustable positioning slot for best camera balance and is designed so that the handle can be on either the left or right side. Box Dimensions (LxWxH) 13.6 x 5.2 x 4.6"
128LP Micro Fluid Head is rated 4.4 out of 5 by 55. Rated 3 out of 5 by stweb from Not Micro I have micro and mini Manfrotto ballheads for my DSLR (Digital SLR) camera and love their compact size, light weight and reliable operation. I wanted a compact and lightweight fluid head for shooting video with my DLSR. The Manfrotto 128LP is a good fluid head but micro is a serious misnomer. The 128LP is a chunky, 1 kg fluid head with a large plate and 4kg load rating. It's overkill to use this for a lightweight DSLR. I wanted a Manfrotto head and was misled by the micro name. Maybe the 128LP will be good for my telephoto lens, or a spotting scope. I'll look for something smaller. Rated 3 out of 5 by Anonymous from Good for what it is. I got this head as part of a kit. I use my Canon for video work, so I needed the ability to pan and tilt. What I like about this head is that the pan/tilt motions are fairly customizable. It takes some playing with but it can be easily used. What I'm not keen on is the way it attaches- I'm used to attaching the camera to a foot instead of screwing it directly into the head. That said, there's more range of motion offered as a result of that attachment, allowing for more close up or wide shots from a slightly altered distance. It's also kind of large and bulky for my needs, but I'll probably use it in studio style settings. Not the best for what I need. Rated 5 out of 5 by DC from Well Built! Many people seem to be attached to the quick release system found on many of todays tripods, but if you want a sturdy head that screws directly to your equipment snugly, this is it! The head is comfortable to use, easy to maneuver, and produces nice smooth pans and tilts. Rated 4 out of 5 by melindathemartian from Nice inclusion! Pretty nice item to include with the tripod I bought. Only problem was I bought a tripod bag that is a little small. So, when I put the tripod in the bag, I have to take the handlebar off. It just slows down the process. Also, no bubble-level on this or the tripod. Probably wouldn't have changed what I purchased, it's just always nice to keep in mind what you're NOT getting, yes? Good first pro-ish tripod and fluid head. I'll be adding to my studio as it grows, but this is the first step. 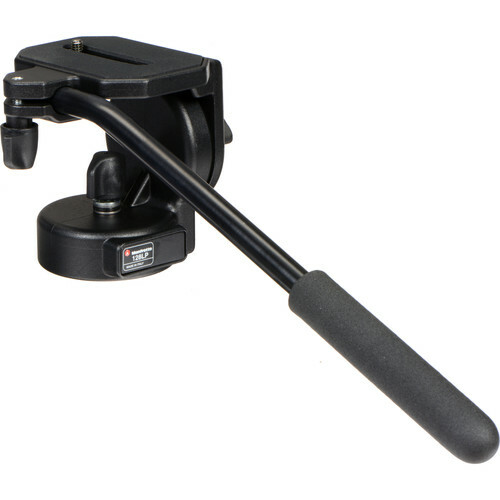 Rated 5 out of 5 by Cyburbs from Great for the Manfrotto 7302YB tripod This little tripod head which easily attaches in seconds makes the 7302YB Manfrotto backpack and tripod kit fully useable for all cameras up to ten pounds. Its worth every penny of its price. Micro fluid head is also fine for DSLR's. It just more steady torque for panning duriing video shots. The backpack tripod kit should come with this micro fluid head, and a camera quick release plate all in one kit. You really need all of these little pieces. If you have a little Manfrotto tripod, you need this little head. The tripod still fits in the backpack with the head hanging out the top, but tied down. Rated 4 out of 5 by Eric from Misnamed - Mini is smaller I bought this to use with a small Canon HD camcorder figuring that Micro in the name would suggest it fit these new tiny cameras. It turned out to be huge in comparison to the camera. And while it worked very smoothly for even complex movements, it was too large for the small Gitzo tripod I'm using and very heavy as well. I returned this for the Manfrotto 700RC2 which is much smaller than this head and has a quick release. Unfortunately, it's not as smooth operating as this one. Rated 4 out of 5 by Anonymous from Reasonably priced I was looking for a fluid head that was inexpensively priced to use with a small table top tripod. This fit the bill and provides smooth movement. However I do feel the movement is a bit stiff. For a larger tripod it would be fine but for a micro setup the tripods feet often move while panning. I coupled this with Manfrotto's table top tripod and 10 extension. Hopefully the head will loosen up with use. Also considering it is labeled Micro I was surprised how large it actually is. I do like that the handle is angled and movable. I am happy with the construction and it seems well built. Rated 4 out of 5 by tnly from Great fluid head for the price, needs minor improvements Would give 5 stars since the head is very fluid in pan and tilt movements. There is no friction control or hardly any but this is expected in this price range. Overall great sturdy head but cannot give 5 stars since I think a couple minor improvements would make it 5 stars. One would be a rosette for the handle, so you can change the angle of the handle. It is fixed angle and can only be adjusted in and out by a couple inches. The second would be a bubble level on the base next to the pan lock. This bubble can be viewed from either left hand use or right hand use. For those who are tired of twisting the 1/4-20 bolt every time you detach your gear from this head, I bought an Arca style clamp, 3.25 inches long, and mounted on this head with some nuts n bolts. Fits nicely on top. Then I put Arca plates on my camera and spotting scope. Now the head is fluid for video work with the camera and birdwatching with the scope. Overall great head, and now adaptable for birding and video. does this not come with a quick release plate if no what kind of quick release plate can this use?? It does not. I use this primarily for theatricals where I have extended recording and did not need the quick release plate, though it would be nice. An accessory listed for this head is the Oben QRA-R2 Quick Release Assembly with RP-20 Plate which has good reviews. I have not tried it. A search of B&amp;H has other quick release plates. some which also give additional sliding adjustment. Make sure the base has a 1/4 thread or if larger has an adapter bushing to reduce the 3/8 thread down to 1/4 to fit the 1/4 thread on the head. Feel free to email askbh@bhphoto.com with any questions you may have about this product. Tripod legs to pair with this head? anything that is heavy-duty (not lightweight) since this head is almost 2 lbs. There is no mention in the specs as to the thread size when attaching to a tripod. Is it 3/8 ? Will an Arca Swiss type plate attach to the top of this? I specifically chose this mode because it doesn't have the proprietary Manfrotto QR plates. It will attach to any tripod with or without QR plates. I chose this one because I was going to leave connected to the tripod.